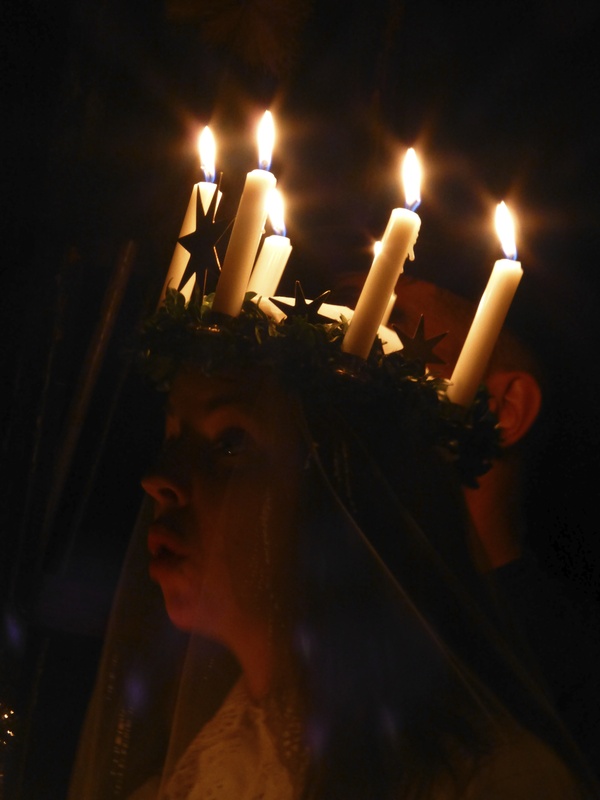 A crown of candles on a white-gowned girl brightens Sweden’s darkest days of winter and celebrates the early Christian martyr, Santa Lucia. It’s not difficult to understand that during a long Scandinavian winter, the notion of light overcoming darkness and the promise of returning sunlight has been welcomed for hundreds of years, and most likely in pagan times too. 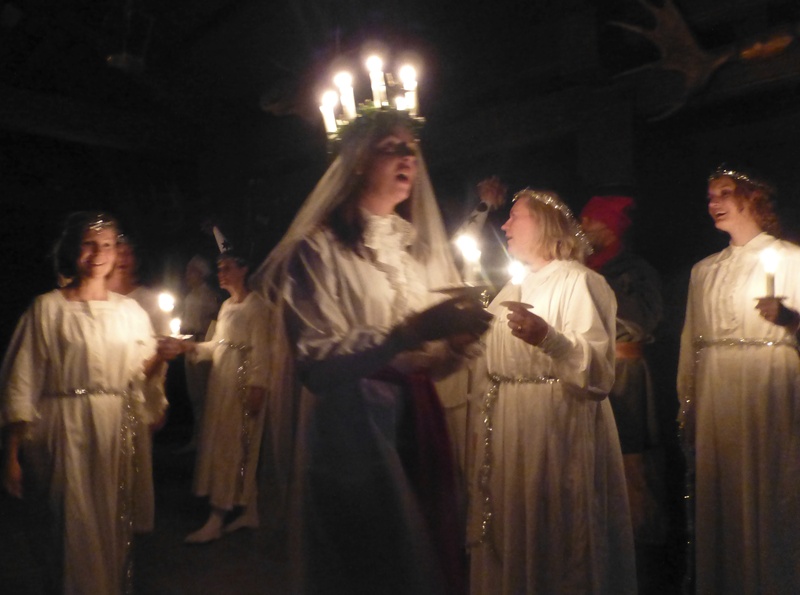 Everyone in Sweden recognises 13 December as Santa Lucia day and listens to a Lucia and her attendants sing the customary song which describes how the Saint triumphed over the darkness and found light. Boys in white gowns carry little lanterns and wear tall paper cones on their heads and sometimes men dressed as chimney sweeps follow the procession, brushing away the darkness. Lucia traditionally wears ‘light in her hair’, which is usually translated these days into a wreath of electric candles, but in one performance I watched a girl walking carefully while balancing the precarious ring of melting wax. Friends who have had the honour of being a Lucia describe the nightmare of removing melted wax from their long blonde hair for hours after their performance. Other Lucia traditions include starting the day with rice porridge – sprinkled with sugar and cinnamon – and eating saffron buns and gingerbread. It’s a happy day, a great warm-up to Christmas, and I’m still humming the Lucia song two days later. Keep humming. It ought to carry you through much! Until the Christmas carols start in earnest! Beautiful, but gosh! I hope her hair doesn’t catch fire!!! It was great to hear beautiful voices and see such a simple tradition upheld. What a beautiful ceremony:) Thanks for sharing the tradition! It was new to me too.